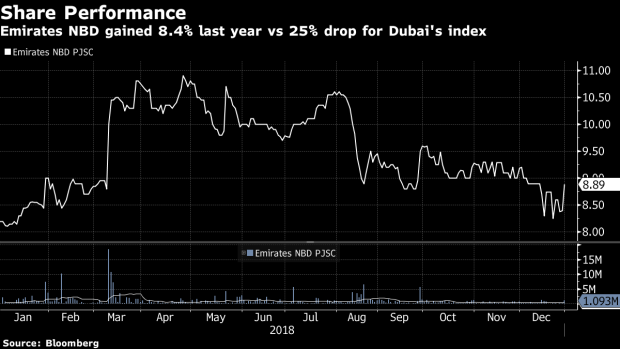 (Bloomberg) -- Emirates NBD PJSC reported a better-than-expected increase in full-year profit as lending rose and loan loss charges fell at Dubai’s biggest bank. The state-controlled lender recommended a dividend of 40 fils a share, unchanged from a year ago. "Margins widened 35 bps in 2018 as rate rises flowed through to the loan book which more than offset a rise in funding costs," Group Chief Executive Officer Shayne Nelson said. "The group’s balance sheet remains healthy with a further strengthening in capital coupled with strong liquidity and stable credit quality." The bank is rated A3 at Moody’s; A+ at Fitch. All have stable outlooks. For financial statement, click here. Stock advanced 8.4 percent in the past 52 weeks. The Dubai Stock Index lost 29 percent. The shares are down 1 percent in the past 5 days and rose 1.1 percent in the past 30 days. Emirates NBD trades at 5.2 times its estimated earnings per share for the coming year. The company’s dividend yield is 4.4 percent on a trailing 12-month basis and 4.4 percent based on Bloomberg Dividend Forecasts for the next 12 months.